How about 5?! Yes, that’s right! Sage Financials offers the use of 5 different types of reporting tools, ready to use along with their Sage Financials user license. The fact that they offer 5 reporting tools is more than enough to impress, but the fact that they come included with your Financials license at no extra cost… Now that’s impressive! So, what are these reporting tools? Salesforce Report Designer, Sage Analytics Studio, Dashboards, Sage Financial Reports (Excel) and lastly Sage Intelligence. 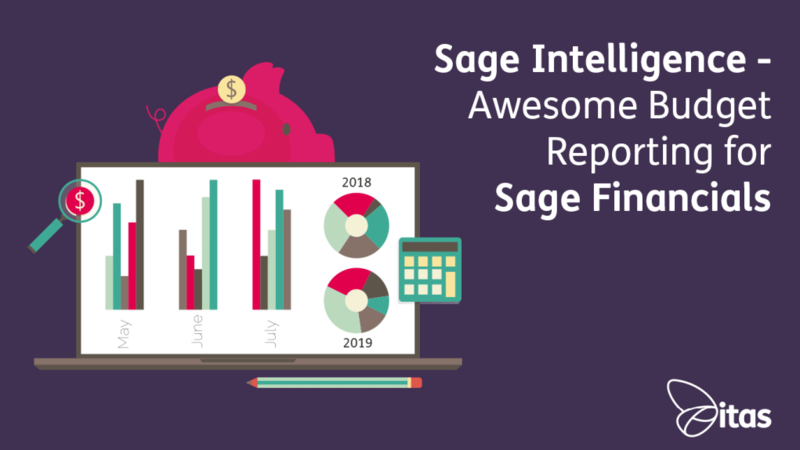 Due to there being so many, we won’t have time to discuss all of them… For this blog, let’s focus on Sage Intelligence and its brilliant Budget Reporting capabilities. One of Sage’s most powerful reporting tools, in my opinion, is Sage Intelligence. Its main strengths include its Key Financial Reports, and the ability to amend existing reports or create new reports easily. You access Sage Intelligence within the Financial Reports tab as shown below. Owing to its user-friendly interface, Sage Intelligence is a great option for all types of users. As like with the other tools, Sage Intelligence gives you default reports to choose dependant on different legislation’s within Sage. In this instance, we are going to be reviewing Budget Reports in the United Kingdom. To enable reporting with Sage Intelligence, the tool will securely pull information from your Org allowing you to report on the data. 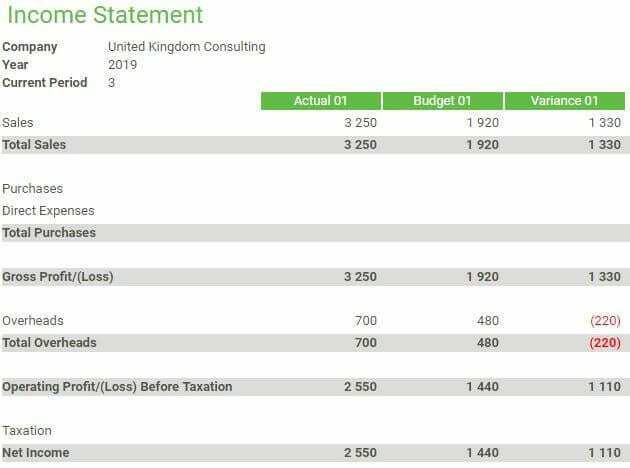 As standard Sage already provide us with an Income Statement that is comparable on Actual VS Budget. This is a great place to start when looking to create custom Budget Reports, but we will talk about that in a bit more detail later on… First off let’s look into this standard Budget Report in a little more detail. The description provided by Sage on this particular report is ‘Displays balances per Account class per financial period for the current financial year, displaying actual, budget & YTD.’ I know right, quite a mouthful! To break that down this default report has been created to show a Financials user a comparison between their Budgeted and Actual Income. This report will look at companies actual Net Income based on their Operating Profit/Loss After Taxation and compare it with the companies budgeted figures. A budget report such as this one is extremely useful for a business when making future budgeting decisions. Within Sage Intelligence the report layout is clear, giving the user a set of relevant and logical data. Another feature that is worth mentioning is that when you export a report from Sage Intelligence, the excel document will be in the same format as displayed within Sage. This means that if you ever need to manipulate reports in Excel, you can do so quite simply due to the formatting Sage provides. As promised, we are now going to look at some customisation of Budget Reports within Sage Intelligence. 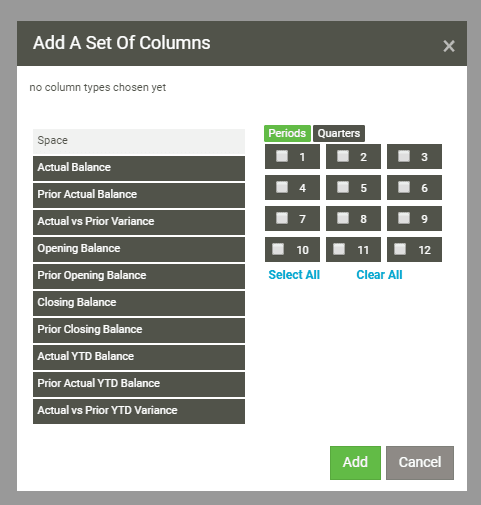 Sage Intelligence makes the creating of custom reports a breeze! The report designer gives the user freedom to create reports that suit their individual needs through its ease of use and flexibility. By using Sage Intelligence, customers have a lot of freedom to report on many attributes of their financial data. Using this reporting tool allows a user to report on dimensions, tags, profit centres, cost centres and everything in between. Having access to this level of detail enables a business to gain better financial insight and helps them make vital future business decisions. An extremely useful component of Sage Intelligence is the capability of being able to “group select”. Usually, when building reports, it can be a very time consuming manual task. Sage has recognised the need to create reports effectively and efficiently and have provided a solution. When creating a custom report within Sage Intelligence you can pull in a default template e.g. Income Statement. To speed things up even further, you can add sets of information to your report as shown below. Manipulation of data can be a difficult process when it comes to variance analysis… Not in Sage Intelligence though! Sage Intelligence uses similar formula fields to Excel, making it feel that little bit more familiar. Having the ability to use a formula to calculate variances across your reports heightens the quality of information a business receives. Although Sage Intelligence is an easy to use reporting tool, it is recommended you undertake some training first. Training on Sage Intelligence will ensure that you are getting the most out of the system. It’s amazing just having the tool… but imagine having the tool and being able to use it to its full potential! Here at itas we offer in-depth report training across all of the tools Sage Financials has to offer. Upon completion of our report training, you will come away feeling like a report building Guru. Get in touch to find out more. Well, almost the end! I hope you have found this blog on Sage Intelligence insightful. If you are still unsure about what kind of tool would suit you, why not check out this blog. Should you have any queries, or would like to know more, please feel free to contact us.